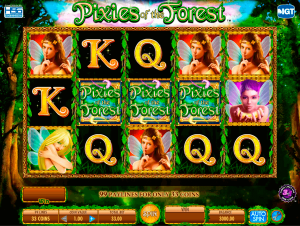 Pixies of the Forest pokie is a beautiful five-reel and 99 payline video pokie from IGT gaming software supplier. The game offers a jackpot of $2000 and an RTP of 94%. There are Free Spins bonuses, and Tumbling Reel bonuses that you can enjoy when you play this pokie game. Give this pokie a try for free, and when you get its feel, then you can play the game for real money at Australian IGT casinos. To play the game, set your wager. The fixed wager is 1/3 coin per line; your total wager will be 33x your coin size. When you are done, click on the spin button to set the reels in motion. Tumbling Reels – All winning symbol combos disappear from the reels and causes symbols to come flowing down from above. You could possibly have numerous tumbles that create a long streak of wins. Free Spins Bonus – Everyone likes free spins and Pixies of the Forest provides you with them when you land three of the bonus symbols on a payline. Wild Symbol – The wild symbol is the main friend in this game. In the game, the symbol appears only on reel 2, 3 and 4, however on free spins mode, they are on all reels, and they create wins. Pixies of the Forest is a delightful pokie game with a great bonus round that can be improved by the Tumbling Reels feature. The game is one of the most entertaining games to play. If you haven’t tried the game yet, then head on to an IGT casino today.